This home of an Oscar winning director provides lots of space for social time and relaxing. 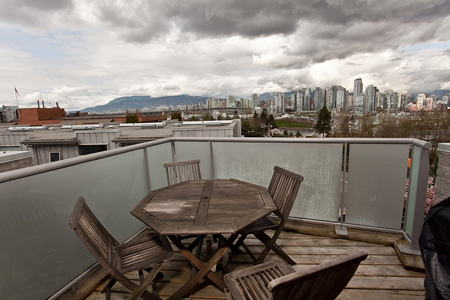 The views are like nothing else that can be found in this centrally located False Creek/South Granville neighbourhood. 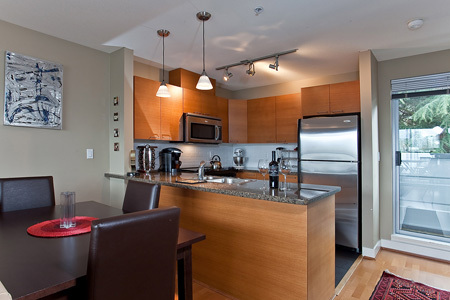 Each floor maintains stunning views of downtown Vancouver and the North Shore Mountains. Some of the best restaurants are only minutes away and most of the Vancouver attractions are close at hand. 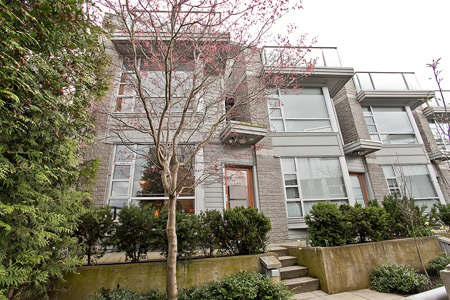 This modern 3 story town home has an open concept kitchen and living space on the top floor that features unobstructed views of False Creek, Granville Island and beautiful downtown Vancouver and the North Shore Mountains. 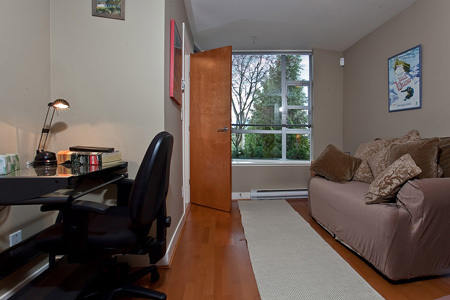 Located at the foot of Fairview Slopes and only minutes from trendy South Granville shopping and Granville Island, you can enjoy every aspect of Vancouver living from this location. 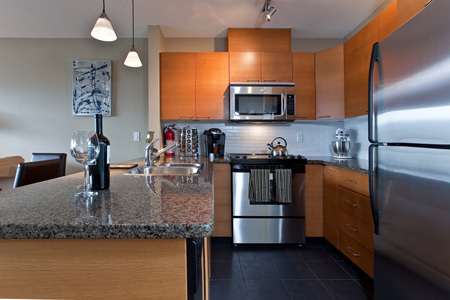 The top floor has the large north facing deck, open kitchen and living area all with a view of the mountains. The second level has the master bedroom with TV and en suite, the second bedroom and spare bathroom. The third bedroom is located on the entrance level. 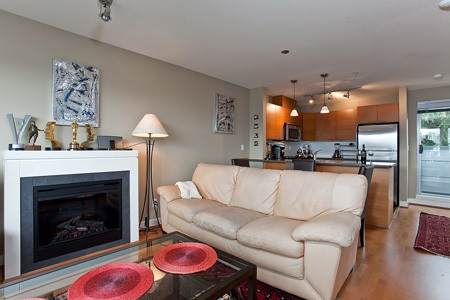 One underground parking spot is included and the suite maintains all the comforts of home with an easy to use cappuccino maker, hardwood floor, Bose iPod dock, flat screen TV and DVD player. Great unit in a good location. 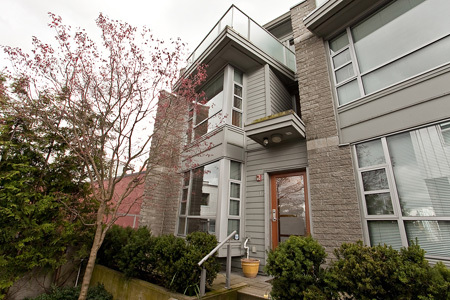 Walking distance to Granville and trams to downtown quite nearby. We really enjoyed our Vancouver stay. We found EMR so helpful from the very beginning of our booking. Isabel was particularly helpful and lovely. 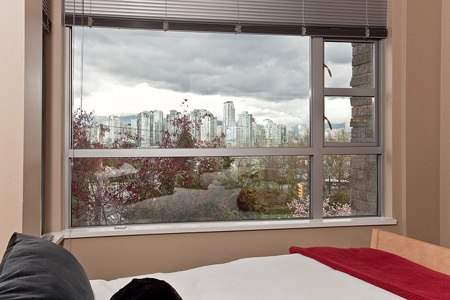 We will definitely book these accommodation again the next time we come to Vancouver. The condo was awesome, view amazing, comfy, clean. 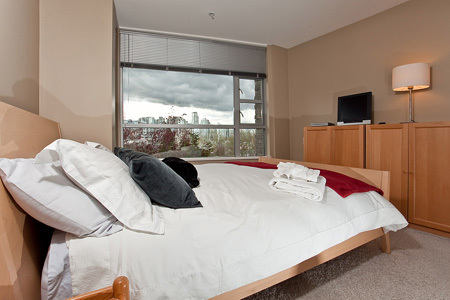 Walking distance from Granville Island and many things. Also close to bus lines. Only a beautiful 30min walk to downtown. We loved it. We were there for a conference, much more economical and relaxing then a hotel, even a great hotel. EMR was awesome. Would suggest to EMR that you allow people to put payment and deposit on different cards. That is a lot of money to put on one card. First of all we would like to say that we had a wonderful time staying in Vancouver and we enjoyed our apartment very much. 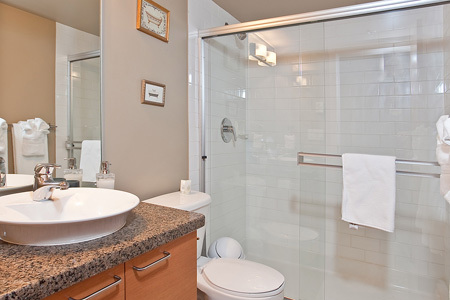 As a family of four we appreciated the three bedrooms and the beds were in perfect condition. 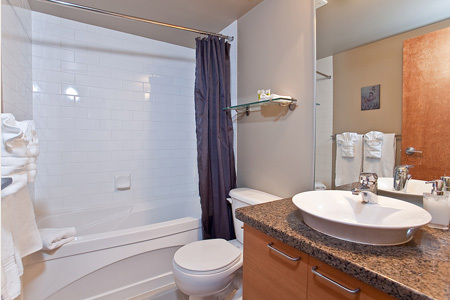 The two bathrooms bathrooms included toilet paper as well as soap and really high quality towels. 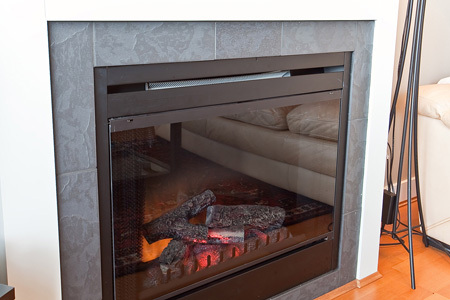 We would like to mention that everything that you consider necessary to feel at home was perfectly provided. 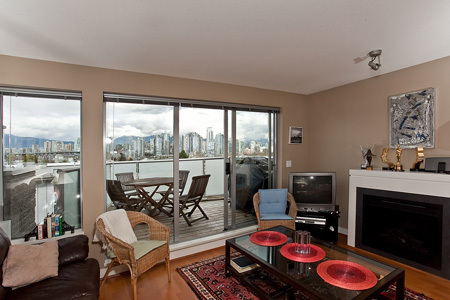 The apartment with the beautiful view over False Creek and Downtown Vancouver was just amazing. The connection to Downtown Vancouver was really easy because you could use Aquabus or just rent bicycles as well as e.g. a rental car garage also included or just the walkway to get into Vancouver. Even local people told us that the apartment we chose for our vacation was the best choice we could have made and said that even they would really liked it. At this point we also would like to say that the summer fireworks that take place in the beginning of August were wonderful to look at from the balcony that's also part of the condominium. 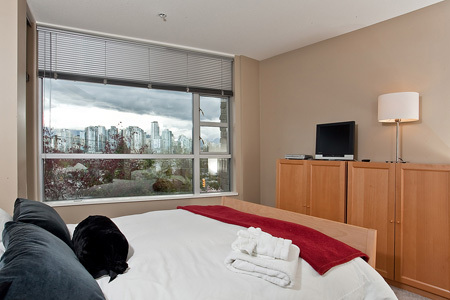 We would recommend this apartment to everybody who wants to have a stay in Vancouver and enjoys a wonderful view over the Downtown skyscrapers and the mountains in the background. 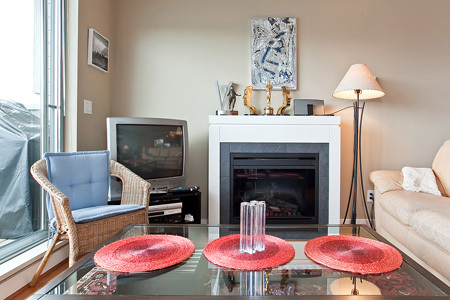 Location is terrific so close to the seawall, Granville Market, West Broadway, restaurants and interesting shops, all within very easy walking distance. A big off leash dog park is nearby too. We loved the location. The views from the condo living room and master bedroom were fantastic - and just what we former Vancouver-ites needed after a long prairie winter. Condo itself is OK. Dining area is very small and we had to move the couch to sit 4 people the table. It was stocked well, good variety of dishes, glasses, tools, pots and pans, etc. Bed in master bdrm was comfy and good bedding. No problems with the WiFi. The BBQ was a wreck. It looks like a big gas BBQ in the pictures and under the cover, but when you take the cover off, its just a very small table-top on top of an old table and it looks like it hasn't been cleaned in years. It was really nasty. Three sets of stairs were a challenge when hauling in groceries. 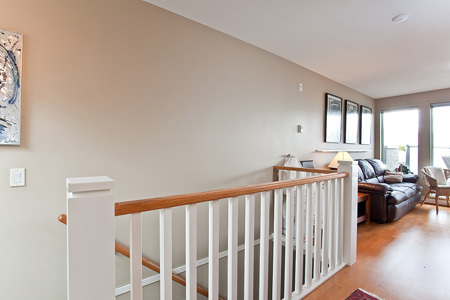 On top of that, 4 smaller sets of stairs from the street level parkade to the front door of the condo. Use the back lane when bringing in supplies, then you only have 2 flights down to the condo level front door vs 4 flights up to. Our greeters were friendly and accommodating. The next door neighbour was friendly. Overall we enjoyed our 9 days there, the location was perfect for what we wanted in this vacation. We thank you for your review! We especially appreciate being informed about the BBQ. We will make sure that this issue are resolved as soon as possible. 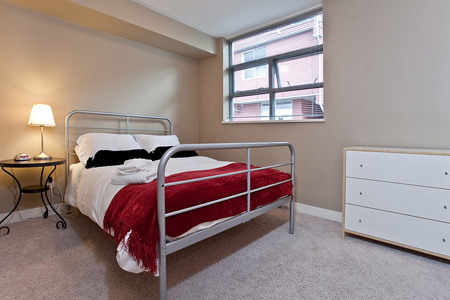 We chose this flat because the views looked so lovely in the pictures, and indeed they were. On our first rather bleary night jet lagthe lights in the skyscrapers glistened in the dark and we caught the mountains rearing in the distance. Magical. The accommodation was perfect for what we wanted and provided a well equipped home from home, the only problem being the toasters fights with the fire alarm. John was very accommodating about our leaving arrangements and made the last day easy for us, which was great. We recommended the house to friends who live in Canada and run trainings in Vancouver. We enjoyed meeting our greeter, and were able to take advantage of some of his suggestions re the area, also dropping off and picking up luggage. Our friends found the 60 steps from garage to living room a little challenging. Though fit, they are not used to stairs. We had all we needed in the townhouse, including very comfortable beds and a spectacular view and sunrise. 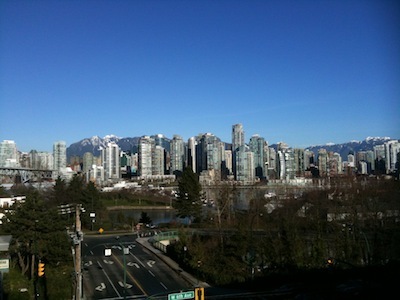 For driving into the city, it is very accessible to Oak and Granville.